Józef Korolkiewicz (1902-1988) was a Polish painter who was fascinated by horses from his early childhood on. After his education at the Warsaw Academy of Fine Arts, he also developed a career as an opera singer, while at the same time he became an athlete specialized in the 400 m hurdle race. He missed the Olympics in Amsterdam in 1928 as result of a contusion. His paintings are not widely known because most of them are in private collections, but that is a reason all the more to select one of them for this Picture of the Month. Korolkiewicz had a special interest in free moving and running horses as shown here. He found an excellent opportunity to study horses at liberty in the state stud of Janow Podlaski on the east border of Poland. There Arabian thoroughbreds and Anglo-Arabians are bred from 1817 until the present time. In this stud the original characteristics of the Arabian thoroughbred are carefully maintained in combination with training on the race course. At monthly auctions a large variety of Arabians and Anglo-Arabians are being sold to buyers all over the world. 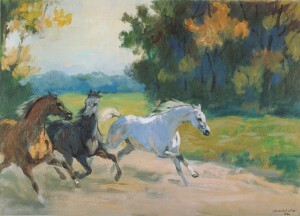 The present painting shows some young stallions running from their stable to the fields where they spend the day. The Prince of Wales (later King George IV) is harnessing his team of two black horses to a phaeton carriage. He has taken off his coat for the work. A groom is assisting him, but the Prince himself is carrying the pole which has to be fixed to the carriage. At the time the phaeton was a very fashionable carriage fitting for people who loved speed and elegance. The black horses with almost equal white stockings at their hind-feet have been carefully selected. Their red brow-bands with rosette match with the red color of the phaeton and the red coat of the groom. The spitz dog Fino accompanies them. This painting is a portrait of the horses, the Prince, the groom and the dog, altogether. 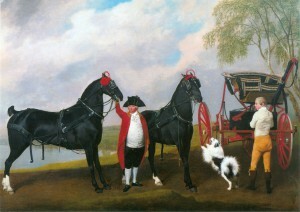 The Prince himself commissioned this painting with George Stubbs.